Does your story suffer from "Multiple Personality Disorder"? Dramatica sees a story as representing a single mind. Most writers have been taught that characters, plot, theme, and genre are people, doing things, illustrating value standards, in an overall setting and mood. 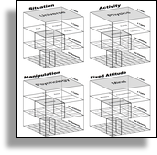 In contrast, Dramatica sees characters, plot, theme, and genre as representing different "families of thought" which go on in the story mind as it grapples with a central problem. Characters are the "drives" of the Story Mind, which often conflict as they do in real people. Plot describes the methods used by the Story Mind in an attempt to find a solution to its central problem. Theme represents the Story Mind's conflicting value standards, which must be played out one against another to determine the best way of evaluating the problem. Genre describes the Story Mind's overall personality. It is in the story TELLING stage where characters take on the trappings of a complete person, not in the story STRUCTURE. Each character needs to be given traits and interests, which round out the character's "presence," making it feel like a real human being. But these trappings and traits are not part of the dramatic structure. They are just window dressing - clothes for the facets to wear so the audience can better relate to them on a personal level. Think about the characters you have seen in successful stories. They might represent Reason, Emotion, Skepticism, or function as the Protagonist or Antagonist, for example. Each of these kinds of characters is an "archetype" because it contains a whole family of drives in one character. For example, a Protagonist may contain the drive to "pursue," and also the drive to be a self-starter, "pro-action." Because these drives work together in harmony, the character becomes archetypal. The individual drives don't have to be bundled in an archetype, however. In fact, each single drive might be assigned to a different character, creating a multitude of simple characters. Or, characters might get several drives but conflicting ones. These characters are more "complex" because their internal make-up is not completely consistent. Regardless of how the drives (also called character "elements") are assigned, each drive should appear in one and only one character. If not, your story may develop Multiple Personality Disorder and leave your audience unable to relate to the story as a whole.